AKA Double Pendulum Valve, Double Gate Valve, Double Flap Gate, Double Dump Valves, Tipping valves, Trickle valves - all names used to refer to the product we invented more than 60 years ago. 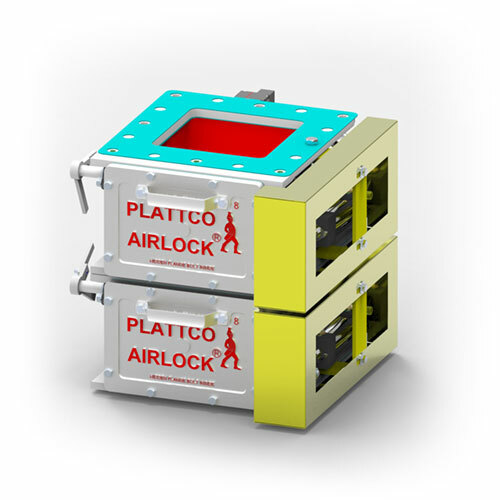 The equipment may go by other names, but there is only one Plattco Double Flap Airlock valve! The S8 Series / Low Profile Valve is built with the same rugged design as our famous H-Series valve at roughly half the height. This low profile valve is great for applications where headroom is restricted. Our solutions are customizable and include the options of metal to metal seals, silicone seals, or sacrificial coatings. No rotary action means no need to build clearance (leakage) into the low profile valve - which eliminates tramp, fugitive air, and emissions through the valve into the system or leakage to the atmosphere. Housing is not part of the seal, allowing it to last for decades in the worst operational environments. 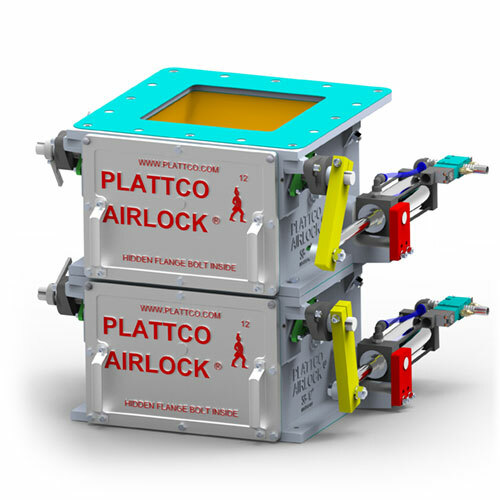 Unlike rotary valves, Plattco’s double flap airlock valves ensure the seal never breaks when filling & emptying. One valve always remains closed to maintain the seal. Rated for applications up to 1800 F/980 C.
All-cast construction & proprietary alloys (Cast Iron, Ni-Resist, Stainless Steel) for durability & wear resistance. Why is Plattco’s reliable, long-lasting seal so important? When you can’t produce the amount of material needed, the result is lower sales, decreased profits, and dissatisfied customers. Our patented high-pressure mechanical shaft seal will reduce maintenance costs, eliminate damage caused by air cutting, and assures a seal up to 15 psi (1 BAR). 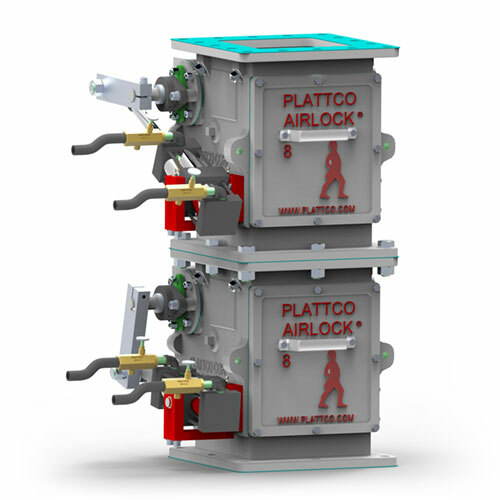 Combined with Plattco’s legendary Easy Maintenance Technology, this exceptional radial valve offers the lowest overall 10 year cost of any other airlock on the market. Not sure if the S8-Series valve is the right valve for your unique needs? 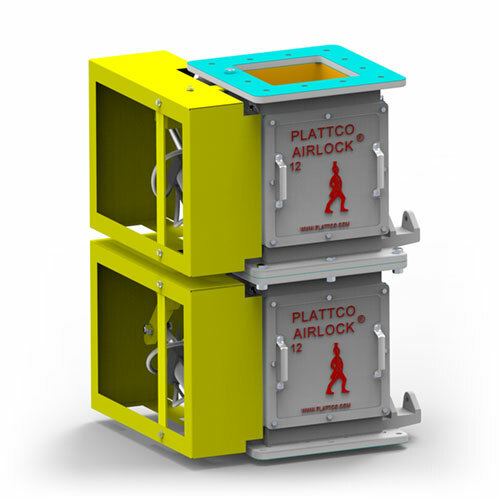 LEARN MORE about the benefits of switching from rotary valves to Plattco Double Flap Airlock Valves. Ideal for dry material handling with successful applications in industries around the world. The robust design of the H-Series is the perfect selection for large volume, large particle sizes, and the most demanding conditions. Rated for up to 40 PSI (2.75 Bar) and temperatures up to 1800F/980C. Same features of the H-Series with an air tight radial (round) opening with round internal mating components (seat/flapper). This valve received its name based on its round (radial) opening. Rated for up to 40 PSI (2.75 Bar) and temperatures up to 1800F/980C. Same rugged design as our famous H-Series Flap Valve at roughly half the height for applications when headroom is restricted. This valve is named for its “S”horter profile than our original H-Series. Rated for up to 15 PSI (1.0 Bar) and temperatures up to 1800F/980C. The perfect valve for pollution control systems and other low pressure differential (< 2 psi/.14 bar) applications, with the same profile as the S8-Series. Rated for up to 750F/400C.